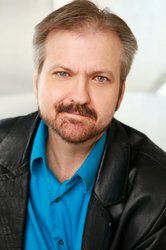 Larry Nemecek, after years as a Star Trek author, editor, archivist, interviewer, producer and consultant, now simply tells people, "I work in Trekland." You probably know him from years as managing editor of Star Trek Communicator, or author of the TNG Companion from Pocket Books and others. Now, he's currently helming his first film project, The Con of Wrath-a documentary preserving the wild and human story behind fandom's greatest "meltdown turned miracle," the 1982 Houston "Ultimate Fantasy" mega-Star Trek show. Of course, TREKLAND is also the name of his blog at larrynemecek.com, with not only his archives and photo galleries plus Larry's latest posts and video chats with Treklanders of all stripes: actors, designers, writers, licensees, and fans too! Larry was seen as a consultant and "talking head" in the Biography Channel's The Captains of the Final Frontier two-hour 2010 special, and even the guest "expert" for the Star Trek episode of G4's Proving Ground series. Offscreen, he's had a had in the original Star Trek: The Experience, the World Tour and such … consulting and commentary for the DVDs … his two columns for the U.K. Star Trek magazines since 1998, now sold in the US …. a content producer for both the original and revamped startrek.com (he was its very first chat guest in 1996) … and the guts of the long-running worldwide Star Trek Fact Files. He and wife Janet also sold the story for the Star Trek: Voyager episode "Prophecy." Suffice to say, Larry's seen a lot come and go in Trekland from his front-row seat in Hollywood-which he shares in tales and humor at his convention talks, both here and abroad in seven countries so far. Fan cred? Larry crewed the first SoonerCons and founded ThunderCon, both Oklahoma City charity conventions, but now he docents at the Historic State Park ranch house of his hero and fellow Okie Will Rogers near Santa Monica, Calif. There's also family, travel, keyboards, politics and of course football-Boomer Sooner !! !